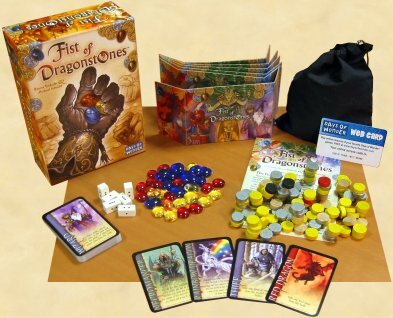 Fist of Dragonstonesâ„¢ is an exciting, closed-fist, bidding game. Players outwit their opponents by using gold and magic coins to buy control of an ever-changing cast of enchanted character cards. Those charactersâ€™ powers will: help players collect Dragonstones; lend them their magical powers; help foil the strategies of their playing companions; and convert Dragonstones into victory. Fist of Dragonstones is the first in Days of Wonderâ€™s line of Unique Mechanic/Unique Materials games. Unique Mechanic â€“ For each character card, players secretly place the number of coins they want to bid in a closed fist. Tension builds until all players reveal their bets at the same time with the winner of the auction then gaining control of the card's powers. Unique Materials â€“ Players vie to win valuable Dragonstones made of various colors of flattened glass marbles. Coupled with wooden coins, 4-color player screens, special scoring dice and beautifully illustrated character cards, Fist of Dragonstones gives players an extraordinarily tactile game playing experience. "It is very fair to say that the game was designed on demand by Bruno and Michael as a follow-up of sorts to Citadels." About 6 years ago I came across a site dedicated to game design. It was a small site, but one feature it offered was a page where game designers could post personal information. I added my own name and email to the page, as did the creator of the site. A third designer joined some time later, his name was Bruno Faidutti. I don't remember anyone else ever joining the small list, but of the three, Bruno has enjoyed the most success with his designs by far. At the time his published games were Knightmare Chess (in a couple languages) and Valley of the Mammoths. In the years since, he's added several games to that list and enjoyed the success of Citadels, a world-wide success and a nominee for the Spiel des Jahres in Germany. Anyone who frequents the online newsgroups and discussion lists knows that Mr. Faidutti is a regular contributor. He always takes the time to answer questions about his own games. He's also present to answer questions about game design and the industry. Consequently, I wasn't too surprised when he happily agreed to answer a few questions via email. I took the time to ask a few personal questions, but I was also very interested in hearing about his upcoming games from Days of Wonder. Here's the result of our correspondence below. Mike Petty: Over the years you've been very visible in online discussions and I've always noted how you're quick to give input and advice to aspiring designers. Why is this important to you to keep in touch with the online community? MP: As I read your past interviews or browse your site, I leave with the impression that you simply love games. Other designers talk about their designs. You talk about the games you enjoy, whether you made them or not. It's as if you'd just as well play games as design them. Would you say that's true? BF: It's true, of course. I design games because I like playing games, and I design the games I would like to play. This also means that my games are probably more influenced by other games than those of designers who hardly know of other's games. MP: What do you like most about games? BF: Hard to tell, because it clearly depends on the game. I like the storytelling aspect of a game, the tension, the break from the outside world, the people around the table and the jokes the game can suggest. It depends. Most of all, I like playing. MP: If you had to entertain your usual group of gaming friends this weekend, but you only had room to take along four games, which current favorites would you end up bringing? BF: A good old classic - a poker deck. A new game I've not found the time to play yet but that I want to play - let's say Ad Acta. A good, light game that always works - let's say Kuhhandel. A good big game, just in case - let's say Puerto Rico. MP: Do you consider yourself good at playing games? BF: Not very good, but rather good. I'm especially good at playing a new game. When me and my gaming group discover a new game that no one has played before, I very often win. This means that I am good at feeling what is important or not in a game, what is the reason for this or that rule. On the other extreme, I'm not that good at games that require regular gaming and experience, like Chess or Go. I was good at chess when I was a teenager, but that's long forgotten. I'm not bad at poker, but I don't play at professional tables. MP: Are you still employed as a teacher? MP: Do you ever play games with your students? BF: No. I usually don't like didactic, pedagogic games. I think a game must make you dream, take a break, and I don't like the idea of putting game in everyday life - no matter for work or studies. On the other hand, I can play games with my students, but not during lectures and a pedagogic tool. Games are a very bad pedagogic tool. MP: As a teacher myself, I'd agree I haven't found many games that I would use in my math classroom, at least not at the high school level. Would you agree, though, that there are many wonderful things we can learn when we play games, even as adults? BF: Of course, we can learn many useful things when playing - such as lying, bluffing, backstabbing, careful planning.... More seriously, playing games has, for sure, a social dimension, and we can learn some things about social interaction when playing. But happily real life social interaction is usually more rich and more complex than what we can attain while playing. MP: Back to gaming with students, I sponsor the game club at the school where I teach. I've found your games to be a great middle ground between the American games the students are used to and the great games coming from Germany that I try to introduce them to. Do you consciously try to take the best of both worlds, so to speak, when you design a game? BF: I like the humor and the strong theme of many American games. I like the simplicity of many German games, and I deliberately try to make something "in the middle", something with a stronger taste than most German games but also less complex or fiddly than most American games. This is probably due to my gaming culture. I've discovered gaming mostly with American games, mostly Cosmic Encounter, then Magic or monsters like Axis and Allies. And I've discovered the German gaming tradition later. Since this time, I try to stay on the border line. MP: You've enjoyed a good deal of success with your games. What's one goal you still hope to accomplish as a designer? BF: Maybe designing a really good party game-something as good as Taboo. Such games look simple, but they are probably the hardest ones to design. MP: I read one of your posts online about a new publisher, Days of Wonder. Is it true they may be releasing one of your previous, and personal favorite games, Murder in the Abbey? BF: It's true. It is due for next year. MP: And in the very near future they will release a game called Fist of Dragonstones, that you created along with Michael Schacht. Could you tell us a little bit about that game? But I'll try to tell a bit more. The last few years, I've been more and more into cooperative design with various other game designers - Michael Schacht being one of them. Michael is a really nice and fun young guy, and it has been great fun working with him. Fist of Dragonstones is our second shared design after Draco and Co. Draco and Co was more my reworking of Michael's idea. This time it's really a common work from the beginning till the end. The game has the now usual fantasy setting, which is very convenient for games having cards with various effects. Any effect is possible - it's just magic. It is somewhat related with my Citadels. The idea was to "recycle" the character system of Citadels in a completely different game. Fist of Dragonstones is an auction game, in which the players bid to hire various fantasy characters - magician, witch, goblin, dwarf... and of course Dragon. These characters allow the player to use their specific abilities, and it's with these abilities that you first collect the precious Dragonstones, and then use them to score points. Among my creations, this one is probably one of my favorites, along with Murder at the Abbey and Citadels. And it's not only a good game, it's a beautiful one. The graphics are astonishing, the components are gorgeous and, though the box is small, there's no empty space in it! MP: Well, I certainly look forward to your new game and we wish you and Mr. Schacht the best with it. Thank you very much for the interview.